A few mouthful of this flavorsome carrot zucchini pilaf with natural plain yogurt, that is all you need to make a complete, comfy and cozy meal. So, today is a mid-weekday. I think time is just flying so fast. A month ago it was New year, and then this month, the Valentine’s day. Half of the February is past already. And now I am so eagerly waiting for the spring to arrive. I am just fantasizing those wonderful pastel shades of nature we get in spring. A break from long snowy winter months would be over soon, and would bring a new SHINE of nature. And in this post I am celebrating this spirit of the coming spring with ‘Carrot Zucchini Pilaf’. We all had too much of sweets in the past few weeks, and now it’s time to give some savory taste to our taste buds. My granny was always worried about me. She used to say—’what kind of a kid are you, who doesn’t like sweets?’ If by any chance I tasted some sweet stuff, she would have been the happiest person at that moment. Well, I could not understand her LOVE for me at those times. But now I can totally co-relate how it feels when a child does not eat particular things. It’s such a huge pain for parents and grandparents. Ufff! Me and my stories—I am so sorry if I made you sad. Alright, let’s all get happy. Let’s talk about this gorgeous ‘Carrot-Zucchini Pilaf’ I made yesterday! A few mouthful of this flavorsome pilaf with natural plain yogurt, that is all you need to make a complete, comfy & cozy meal. If we want a simple yet exotic dinner, I often prepare this, and serve this pilaf to my family. This carrot-zucchini pilaf is a BIG HIT at my home. This easy style pilaf has got flavors, veggies, spices, and rice! And this is also simple, quick, no pain all gain recipe! It’s extra warm and comfy. Most of us need something warm, and cozy these days. And this pilaf has everything to keep you feeling all warm. I am talking about spices, rice, and garlic—all real winter essentials. This plateful of pilaf would taste as if you went to a fancy restaurant and ordered a fancy meal. Nothing beats that! 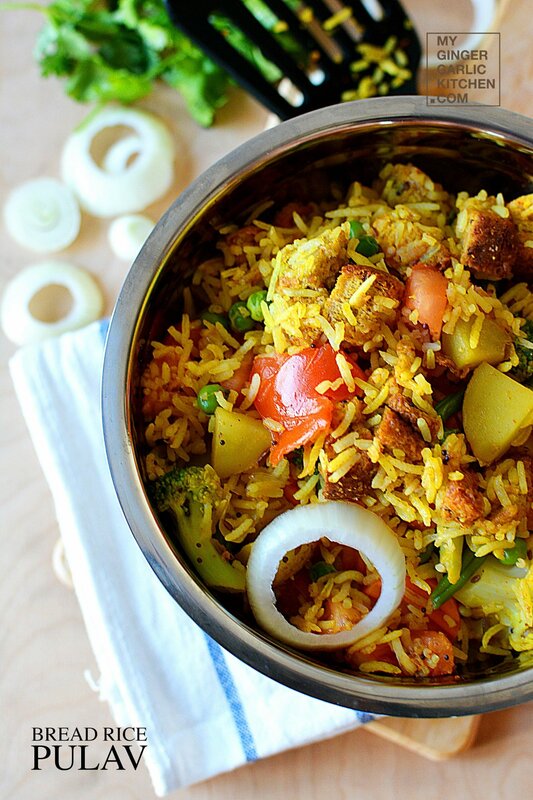 This is a kind of concoction between the biryani and pulav means double YUMMY! You don’t have to be an expert chef to make this AWESOME pilaf at home and to make your loved ones happy. For me, cooking is all about making my family happy. No fancy skills are required there! 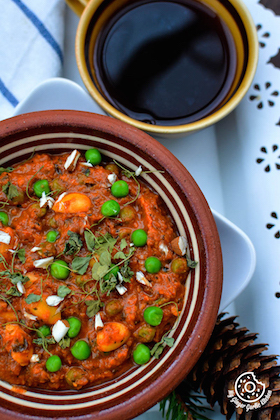 I added some spicy curry powder to this recipe. However, if you don’t love curry powder you can replace this with red chili powder. While it takes less than an hour to make, it’s the perfect dish for a weekday night. Take a heavy bottom pan. Add oil to it, and let it heat. Add cumin seeds, green cardamom, cinnamon stick, dried red chili, black cardamom, and star anise. Sauté for few seconds. Add chopped onions, chopped garlic, and sauté for few minutes. Now add tomatoes, green chilies and sauté for 3-4 minutes. Add grated carrot, grated zucchini, salt and sauté for 5 minutes. Add curry powder, garam masala powder, and mix well. Add drained rice, and 2 cups of hot water. Mix well, and let the water come to boil. Cover and cook in low flame for about 10 minutes or until the rice is well cooked. Do not overcook the rice. Then drizzle a tbsp of clarified butter on top, if you want. Garnish with coriander leaf, purple grapes, raisins and fresh salad. 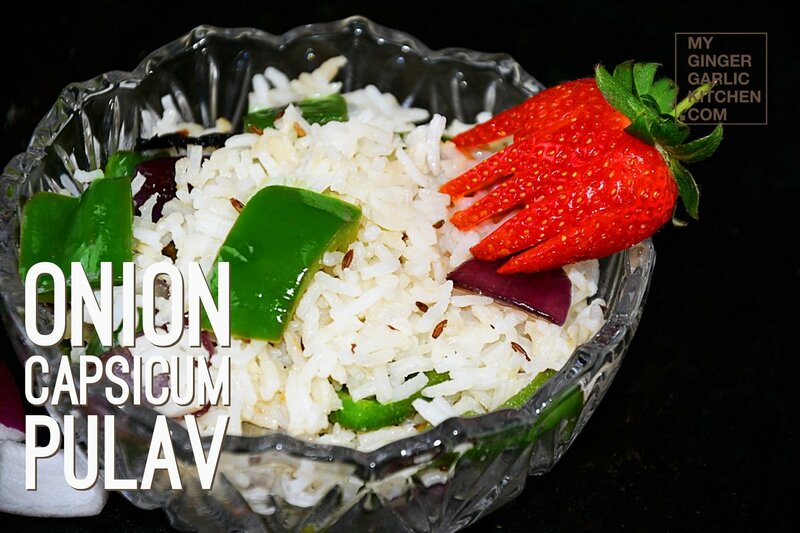 Serve hot with Yogurt and some pickle. A few mouthful of this flavorsome Carrot Zucchini Pilaf with natural plain yogurt, that is all you need to make a complete, comfy & cozy meal. Take a heavy bottom pan. Add oil to it, and let it heat. Add cumin seeds, green cardamom, cinnamon stick, dried red chili, black cardamom, and star anise. Saute for few seconds. Add chopped onions, chopped garlic, and saute for few minutes. Now add tomatoes, green chilies and saute for 3-4 minutes. Add grated carrot, grated zucchini, salt and saute for 5 minutes.